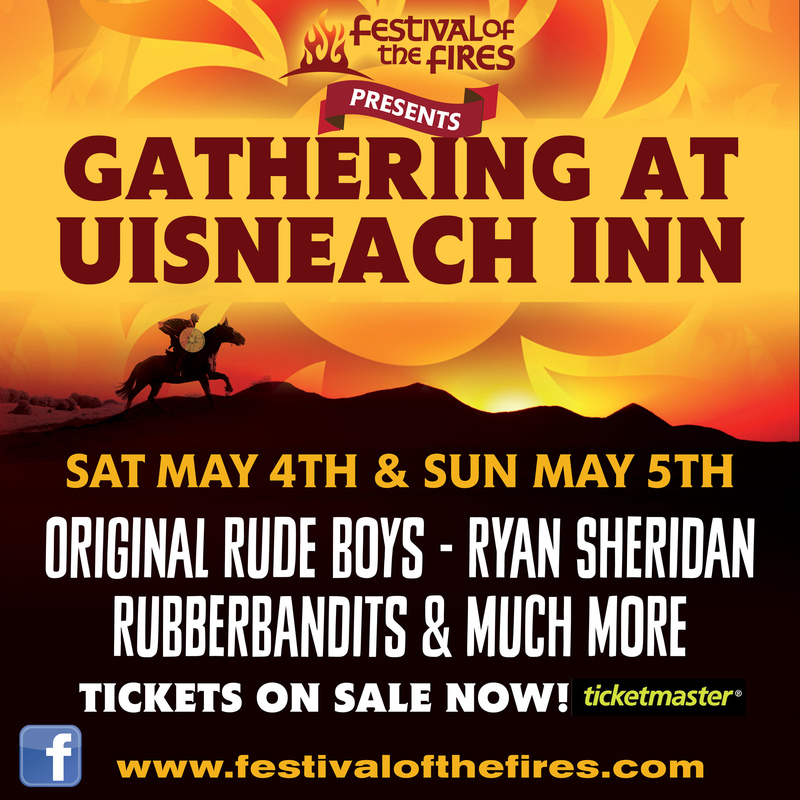 The people behind the multi-award winning Festival of the Fires are keeping its flame burning this May Bank Holiday weekend when they host a spectacular two-day ‘Gathering at Uisneach’ at the Uisneach Inn in Mullingar, and as a special incentive for visitors to Ireland for ‘The Gathering’, anyone with a recent flight ticket or proof of entry will gain free entry! Tourists and visitors to the country must be accompanied by a ticketholder, and must also email us in advance with their intentions, and once you get here we’ll be glad to extend a hearty Irish welcome to the best festival of the summer. Indeed, we’re the first major event of the summer, so what better way to ignite your summer in Ireland? Email us info@festivalofthefires.com to register! The two day boutique music festival will feature music from some of the biggest names in Irish music, all gathered together at Ireland’s most central venue at the foothill of the historic Hill of Uisneach, one of Ireland’s best-kept secret tourist destinations. The venue will come alive with many of the amazing elements that made Festival of the Fires the biggest and most celebrated arts, cultural and ceremonial event in the country – amazing music, arts and crafts, family entertainment, fire ceremonies and performers, re-enactments, history and heritage, spoken word, theatre, poetry, family fun, local food and drink. A special outdoor arena and three music stages will play host some of the biggest names in Irish music, all of whom are making waves internationally. Among them are Irish hip-hop-pop kings The Original Rude Boys, currently touring the globe with The Script and about to sell out the Olympia for the second time in less than a year. Finally bringing their horse to Mullingar in their debut Westmeath appearance, The Rubber Bandits also play. The Riptide Movement have just been announced as tour support for The Rolling Stones, and they set to play at every major European festival this summer (including Glastonbury & Benicassim). Perennial festival favourites Kíla bring their sublime blend of traditional music to the shadow of Uisneach for the fifth year running, whilst the brilliant Ryan Sheridan and the band about to break it in the UK and Europe. The best reggae, rock, pop and folk acts from around the country are joining them, including Irie-Land, Barley Mob, The Aftermath, The Raglans, Driftwood Manor and star of the Late Late Toy Show Ashley Tubridy and many more besides. ‘Gathering at Uisneach’ will take place over the Bealtaine, May Bank Holiday weekend on Saturday May 4th and Sunday May 5th. The event is supported by Westmeath County Council and the Irish Public Bodies Insurance, and it will see hundreds of visitors flock to Westmeath for the best in arts and culture all weekend long. Keeping with the tradition of Festival of the Fires the history and heritage of Uisneach will be to the fore, with historical talks and exhibitions. Of course no Bealtaine event could be complete without fire, and the Uisneach Inn will play host to a spectacular fire shows nightly at 9pm. Tickets are on sale now from all Ticketmaster outlets nationwide and online from Ticketmaster.ie. Day tickets are €25, weekend tickets €40 and weekend passes with camping and parking €50. www.facebook.com/festivalofthefires, email: info@festivalofthefires.com or follow on twitter: @festivaloffires. This entry was posted on Thursday, April 25th, 2013 at 4:02 pm	and is filed under Uncategorized. You can follow any responses to this entry through the RSS 2.0 feed. Both comments and pings are currently closed.